When you think of calcium, you probably think of the mineral that helps keep your bones strong. But calcium benefits go beyond bone mass and strength, so having a calcium deficiency can take a negative toll on the overall state of health. Calcium makes up one to two percent of a person’s body weight, and 99 percent of it can be found in your bones and teeth. The remaining circulates in the blood, muscles, and other tissues. Often referred to as hypocalcemia, calcium deficiency can increase one’s risk of developing osteoporosis. Common symptoms of calcium deficiency include weak hair, nails, memory problems, and seizures. 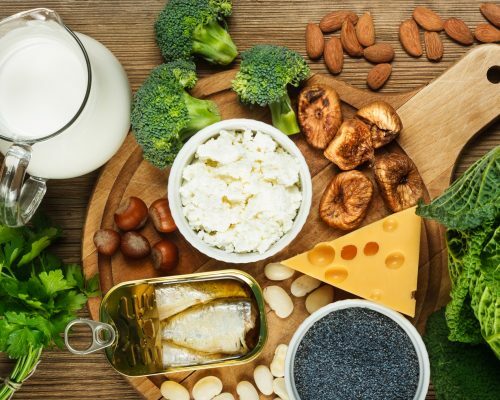 One of the reasons for calcium deficiency is a deficiency in vitamin D.
Although you may think that boosting your calcium intake with supplements is the answer, it really isn’t. In fact, going beyond the recommended dosage of calcium can actually be fatal. As we age, our bones become thinner and less dense, which increases our daily requirement for calcium. For women over the age of 51, the daily recommended calcium intake is 1,200 mg and for men, it’s 1,000 mg, which increases to 1,200 mg after the age of 71. Women need to amp up their calcium intake earlier than men because their bones are naturally thinner, which means more calcium is lost at an earlier age. Furthermore, women start losing estrogen as they age due to menopause. Estrogen offers protective benefits to bones, but once its levels drop, bones become weaker as a result. Aside from the natural aging process, other causes for calcium deficiency include low levels of vitamin D – vitamin D is necessary to absorb calcium – too much potassium, and certain medications such as those for thyroid replacement. Calcium deficiency symptoms can then lead to ailments such as kidney stones and osteoporosis. You may also find you’re more prone to bone fractures and breaks. Complications resulting from calcium deficiency include eye damage, abnormal heartbeat, and osteoporosis. Complications of osteoporosis include disability, spinal fractures, difficulty walking, and other bone fractures. If calcium deficiency isn’t treated, it can be a fatal condition. These foods can help boost your calcium levels naturally as calcium supplements can pose risks to your health. Vegetables: Most dark, leafy greens will pack calcium, but collard greens have the highest content of calcium in the leafy green category. A typical serving is eight ounces packing 360 mg of calcium! Not bad for something that isn’t dairy. Furthermore, broccoli and kale respectively provide 200 mg and 180 mg per eight-ounce serving. As you can see, you don’t have to strictly stick with dairy in order to get your daily intake of calcium. Seafood: If you’re looking for a fish alternative, look no further than sardines, salmon, and shrimp. These items can give you between 125 and 325 mg of calcium per serving! Dairy: If you wish to stick with dairy, your best options are partly skimmed ricotta, low-fat plain yogurt, and milk. These calcium-rich foods provide between 300 and 355 mg of calcium per serving. Using chopped kale as your base, add additional calcium-rich foods like almonds, beans, dried figs, and maybe some oranges. Dress with a little olive oil and vinegar and toss! The great thing about salads is, you can add in all the items you enjoy eating. If you incorporate additional calcium-rich foods into your salad, you can further enhance your calcium-rich diet for strong bones. When it comes to the seafood, sardines can be easily eaten from the can, added to other meals or enjoyed on their own. There are endless ways to cook salmon and shrimp, for example, on the BBQ or baked in the oven with some lemon slices. Enjoying a healthy serving of fish is also important to receive omega-3s – another nutrient essential to proper health. Lastly, dairy products can be a great snack on their own or combined with other food items. Milk can be used in baking or poured over calcium-fortified cereal. Yogurt is easy to take with you on the go, and cheese can be added to just about anything. No matter how you enjoy these calcium rich foods, know that you’re doing your body good in the long run. If you can’t consume dairy products, here are the top non-dairy options to boost your calcium. Before amping up calcium in your diet, always speak to your doctor beforehand to know where you currently stand and see how much more calcium you need to add. Dietary sources of calcium are always safer than taking supplements.